Vladimir Nabokov The Gift: "There on the slopes of a snowy range, which were drowned in the rich, rosy foam of great rhododendrons... I looked in May for the slate-gray, orange-spotted larvae of the Imperial Apollo... From the rhododendrons and from the pines draped in lacy lichen came a heady smell of resin" (p.123). A.E. 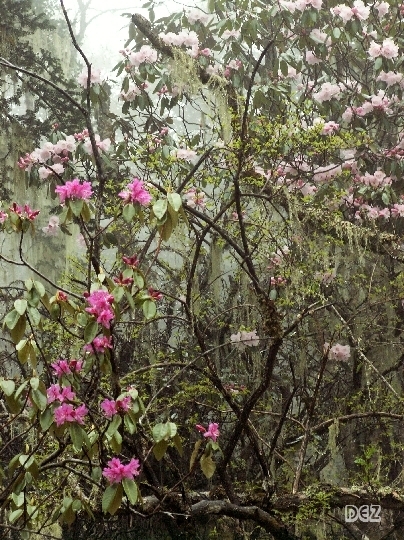 Pratt (1892): “Near by was a small lake, the banks of which were clothed in rhododendrons. The pine trees had a beautiful lichen growing on them of a pea-green colour, which hung from the limbs and branches in graceful festoons” (p.188).